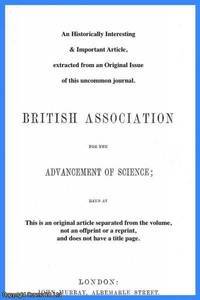 Report of the British Association for the Advancement of Science, 74th. Meeting, Cambridge, 1904, 1904. First Edition. Disbound. Very Good Condition. Octavo. 2 pages. Note; this is an original article separated from the volume, not a reprint or copy. Quantity Available: 1. Category: British Association for the Advancement of Science; Inventory No: 149988..
Report of the British Association for the Advancement of Science, 74th. Meeting, Cambridge, 1904, 1904. First Edition. Disbound. Very Good Condition. Octavo. 2 pages. Note; this is an original article separated from the volume, not a reprint or copy. Quantity Available: 1. Category: British Association for the Advancement of Science; Inventory No: 214049..
Report of the British Association for the Advancement of Science, 74th. Meeting, Cambridge, 1904, 1904. First Edition. Disbound. Very Good Condition. Octavo. 2 pages. Note; this is an original article separated from the volume, not a reprint or copy. Size: Octavo (standard book size). Quantity Available: 1. Category: British Association for the Advancement of Science; Inventory No: 221123..
American Catholic Quarterly Review, 1903, Volume XXVIII, 1903. First Edition. Disbound. Very Good Condition. 20 Pages. Note; this is an original article separated from the volume, not a reprint or copy. Quantity Available: 1. Category: American Catholic Quarterly Review; Inventory No: 145323..
Royal Agricultural Society of England, 1935. First Edition. Disbound. Very Good Condition. 9 pages with 3 photographs. Note; this is an original article separated from the volume, not a reprint or copy. Size: Octavo (standard book size). Quantity Available: 1. 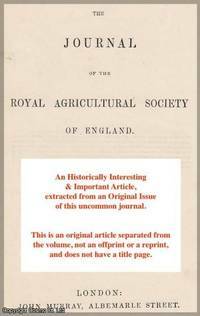 Category: Journal of The Royal Agricultural Society of England; Inventory No: 147873..
Report of the British Association for the Advancement of Science, 74th. Meeting, Cambridge, 1904, 1904. First Edition. Disbound. Very Good Condition. Octavo. 3 pages. Note; this is an original article separated from the volume, not a reprint or copy. Quantity Available: 1. Category: British Association for the Advancement of Science; Inventory No: 149970..
Report of the British Association for the Advancement of Science, 74th. Meeting, Cambridge, 1904, 1904. First Edition. Disbound. Very Good Condition. Octavo. 3 pages. Note; this is an original article separated from the volume, not a reprint or copy. Size: Octavo (standard book size). Quantity Available: 1. Category: British Association for the Advancement of Science; Inventory No: 221105..
Report of the British Association for the Advancement of Science, 74th. Meeting, Cambridge, 1904, 1904. First Edition. Disbound. Very Good Condition. Octavo. 3 pages. Note; this is an original article separated from the volume, not a reprint or copy. Quantity Available: 1. 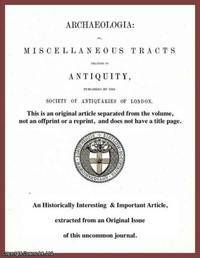 Category: British Association for the Advancement of Science; Inventory No: 214031..
Archaeologia: or Miscellaneous Tracts relating to Antiquity. Volume 55, Part 1. 1896, 1896. First Edition. Disbound. Very Good Condition. 60 pages with 6 illustrations + 1 large plate. Note; this is an original article separated from the volume, not a reprint or copy. Size: Quarto. Quantity Available: 1. Category: Archaeologia; Inventory No: 198484..
Archaeologia: or Miscellaneous Tracts relating to Antiquity. Volume 55, Part 1. 1896, 1896. First Edition. Disbound. Very Good Condition. 60 pages with 6 illustrations + 1 large plate. Note; this is an original article separated from the volume, not a reprint or copy. Size: Quarto. Quantity Available: 1. Category: Archaeologia; Inventory No: 157367..
Archaeologia: or Miscellaneous Tracts relating to Antiquity. Volume 55, Part 1. 1896, 1896. First Edition. Disbound. Very Good Condition. 60 pages with 6 illustrations + 1 large plate. Note; this is an original article separated from the volume, not a reprint or copy. Size: Quarto. Quantity Available: 1. Category: Archaeologia; Inventory No: 169768..
Royal Agricultural Society of England, 1932. First Edition. Disbound. Very Good Condition. 6 pages. Note; this is an original article separated from the volume, not a reprint or copy. Size: Octavo (standard book size). Quantity Available: 1. 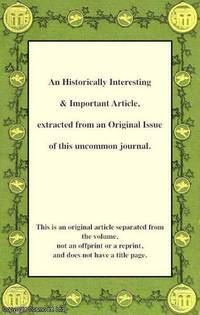 Category: Journal of The Royal Agricultural Society of England; Inventory No: 147467..
Glasgow Medical Journal, Vol. 5. August 1832. (No.19. ), 1832. First Edition. Disbound. Very Good Condition. Octavo. 23 pages. Note; this is an original article separated from the volume, not a reprint or copy. Quantity Available: 1. Category: Glasgow Medical Journal; Inventory No: 145550..
Royal Agricultural Society of England, 1891. First Edition. Disbound. Very Good Condition. 7 pages. Note; this is an original article separated from the volume, not a reprint or copy. Size: Octavo (standard book size). Quantity Available: 1. Category: Journal of The Royal Agricultural Society of England; Inventory No: 147389..
American Catholic Quarterly Review, 1904, Volume XXIX, 1904. First Edition. Disbound. Very Good Condition. 18 Pages. Note; this is an original article separated from the volume, not a reprint or copy. Quantity Available: 1. 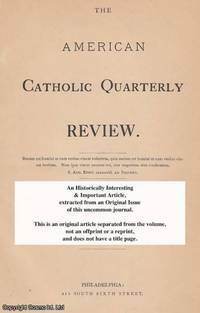 Category: American Catholic Quarterly Review; Inventory No: 145356..
American Catholic Quarterly Review, 1880, Volume V, 1880. First Edition. Disbound. Very Good Condition. 13 Pages. Note; this is an original article separated from the volume, not a reprint or copy. Quantity Available: 1. Category: American Catholic Quarterly Review; Inventory No: 144301..
Royal Agricultural Society of England, 1927. First Edition. Disbound. Very Good Condition. 9 pages with 5 illustrations. Note; this is an original article separated from the volume, not a reprint or copy. Size: Octavo (standard book size). Quantity Available: 1. Category: Journal of The Royal Agricultural Society of England; Inventory No: 148081..
American Catholic Quarterly Review, 1901, Volume XXVI, 1901. First Edition. Disbound. Very Good Condition. 17 Pages. Note; this is an original article separated from the volume, not a reprint or copy. Quantity Available: 1. Category: American Catholic Quarterly Review; Inventory No: 145194.. 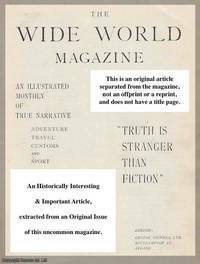 Wide World Magazine, November, 1960, 1960. First Edition. Disbound. Very Good Condition. Octavo.6 pages with 2 photos and 2 illustrations. Note; this is an original article separated from the volume, not a reprint or copy. Quantity Available: 1. 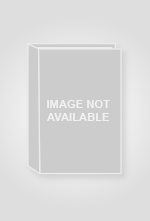 Category: Wide World Magazine; Inventory No: 161875.. Agricultural History Review, 1982. First Edition. Disbound. Very Good. 15 pages, 5 tables. Note; this is an original article separated from the volume, not a reprint or copy. Size: Quarto. Quantity Available: 1. Category: Agricultural History Review; Inventory No: 224402..